Acid rain facts highlight the importance of protecting the environment and cherishing what we have without damaging it. Acid rain constitutes a mixture of dry and wet deposited material that comes from the atmosphere. It contains a higher amount of sulfuric and nitric acids than normal. This type of rain is acid in nature, containing particular dangerous pollutants in the air triggered by industrial processes and cars. Some specialists define it as snow, sleet, fog or rain that has a disastrous effect due to its content of industrial combustions and fossil fuel that emit sulfur dioxide and nitrogen oxide. The level of acidity depends on the pH level of the water droplets. Generally, normal rainwater is only slightly acidic, having a pH range of about 5.3-6.0. This is due to the fact that water and carbon dioxide present in the air react together, forming carbonic acid. In case the pH level of rainwater is lower than this, then it transforms into acid rain. These gases react with oxygen, water molecules and other chemicals in the atmosphere. Hence, there form mild acidic chemical compounds, like nitric and sulfuric acid, resulting in acid rain. 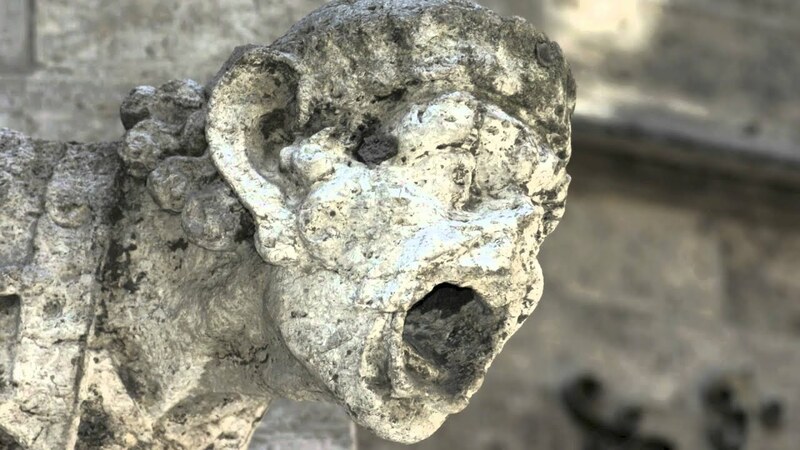 Acid rain has devastating effects on the environment, leading to corrosion of metals, weathering of buildings, and peeling of paints on surfaces. Furthermore, erupting volcanoes also contain certain chemicals which can use the acid rain. Other sources of chemicals are automobiles, running of factories and burning of fossil fuels, increasing the amount of pollutants in the atmosphere. A lot of areas on the globe are affected by acid rain like the northeastern United States, southeastern Canada, Sweden, Germany, Norway and most of Europe. Specialists indicate that acid deposition is also found in Southern India, Sri Lanka, South Africa, and South Asia. Acid deposition occurs in two different forms, namely dry and wet. The wind blows the acidic chemicals into the air, to the areas where the weather is dry. The acidic pollutants slip into smoke or dust, falling to the ground as dry particles. They remain on the ground or different other surfaces like buildings, trees, houses, and cars. About 50% of the acidic pollutants in the atmosphere fall back through dry deposition. These pollutants are washed away by rainstorms. The wind blows the acid chemicals into the air, towards the areas with wet weather. Hence, those acids fall to the ground in the form of mist, snow, fog, sleet, and rain. The acid from the atmosphere is removed, being stuck to the surface of the earth. When the acid flows through the ground, it impairs the habitat of numerous species of animals, plants and aquatic life. The water that drains reaches canals and rivers, being later mixed with sea water and affecting marine habitats. Acid rain was discovered in the 1800s, during the Industrial Revolution. Back then, a Scottish chemist, Robert Angus Smith, has discovered the phenomenon in 1852. He revealed that this constitutes the relationship between atmospheric pollution and acid rain in Manchester, England. The term ‘acid rain’ was developed in 1972. Back then, the NY Times published some reports regarding the climate change effects. They have started arising because of the occurrence of acid rain in the Hubbard Brook Experimental Forest in New Hampshire. What determines the formation of acid rain? Acid rain appears due to both human-made and natural sources. However, in most cases, this mainly forms due to combustion of fossil fuels that results in emissions of nitrogen oxides and sulfur dioxide. We know that many human activities influence the boost of climate change effects. Our activities lead to dangerous chemical gas emissions like nitrogen and sulfur. These two components are the main contributors to acid rain. The most damaging human activities include sources of air pollution that emit nitrogen and sulfur gases such as automobiles, power generation facilities and factories. The biggest contribution is the use of coal for electrical power generation. The gaseous emissions contribute to acid rain. Factories and automobiles release high scores of greenhouse gas emissions into the air every day. In the atmosphere, these gases react with oxygen, water, and other chemicals. Hence, they form acid compounds like ammonium nitrate, nitric acid, and sulfuric acid. The winds blow the acidic compounds over wide areas of land, even across borders. They fall back to the ground in the form of acid rain or other types of precipitation. The main natural contributor to acid rain is volcanic emissions. Volcanoes emit acid and produce gases that trigger a higher amount of acid rain. This affects residents’ health and vegetation cover. Furthermore, biological processes, wildfires, and decaying vegetation also trigger the occurrence of acid rain. A major biological contributor to sulfur-containing elements in the atmosphere is dimethyl sulfide. Specialists argue that lighting strikes also produce nitric oxides which react with water molecules through that electrical activity. In this way, nitric acid is produced, and it triggers the formation of acid rain. Acid rain affects the aquatic environment when it directly falls on it or when it gets run off fields, roads, and forests, reaching lakes, rivers and streams. When the acids accumulate in the water, they lower the pH level of the entire water body. Aquatic animals and plant need a specific pH level of 4.8 to survive. In case the pH level falls below this limit, the life conditions become hostile, and the ecosystem can be affected. 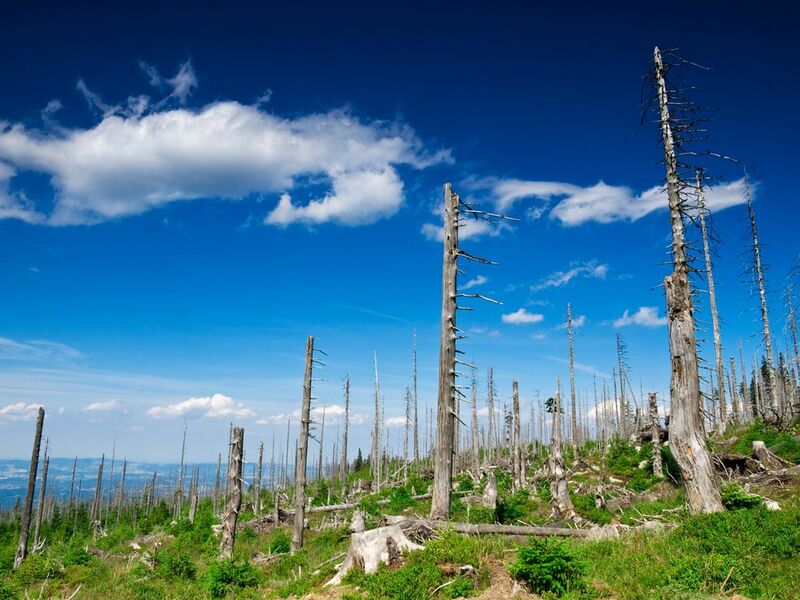 Acid rain can also have a dangerous effect on forests. Trees are more vulnerable to extreme weather, insects, and diseases when acid rain destroys their bark, leaves and impair their growth. This type of forest damage is evident in Switzerland, Poland, and Germany. All these acid rain facts indicate how dangerous human-made activities could be, impairing the atmosphere due to greenhouse gas emissions. All these dangerous emissions can fuel the formation of acid rain which, in turn, affects forests, aquatic animals, plants, the soil, architecture, and public health. By diminishing the level of pollutants, we also diminish the chances of acid rain formation.